While Scotland is busy deciding its future, I find myself pondering the art of that country. It’s tricky. There are a lot of artists in Scotland. There are a lot of Scottish artists. The two groups overlap of course, but there draw things out as a venn diagram and the centre is less populated than I perhaps expected. As ever, of course, this may be largely down to my own ignorance; and, as regular readers will know, I’m easily confused. The political debate in Scotland has been exciting. This is a debate driven in no small measure by passion and hope. The decision that is being made is a hard one and for many I suspect head and heart lie, somewhat uncomfortably, in different camps. 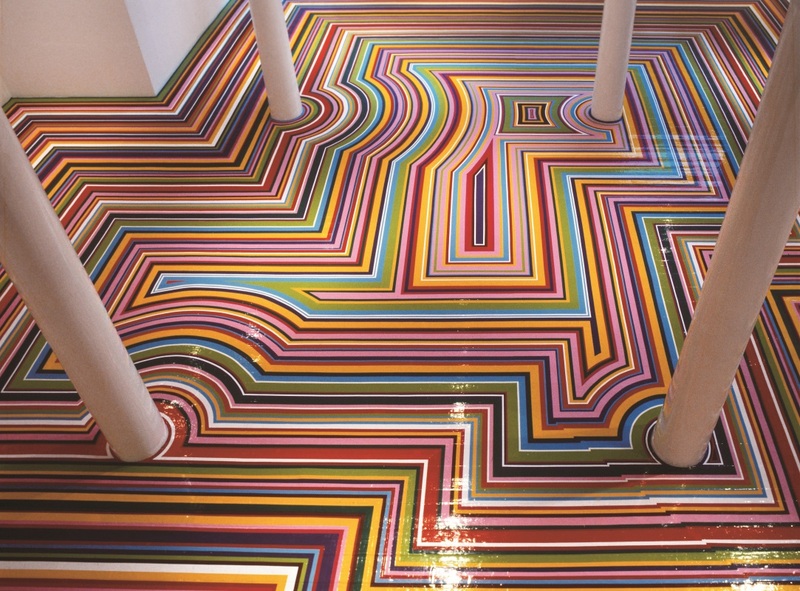 It’s this sense of not knowing quite which way I’d jump if I found myself in similar circumstances that brings me, in a typically convoluted manner, to the work of Jim Lambie. 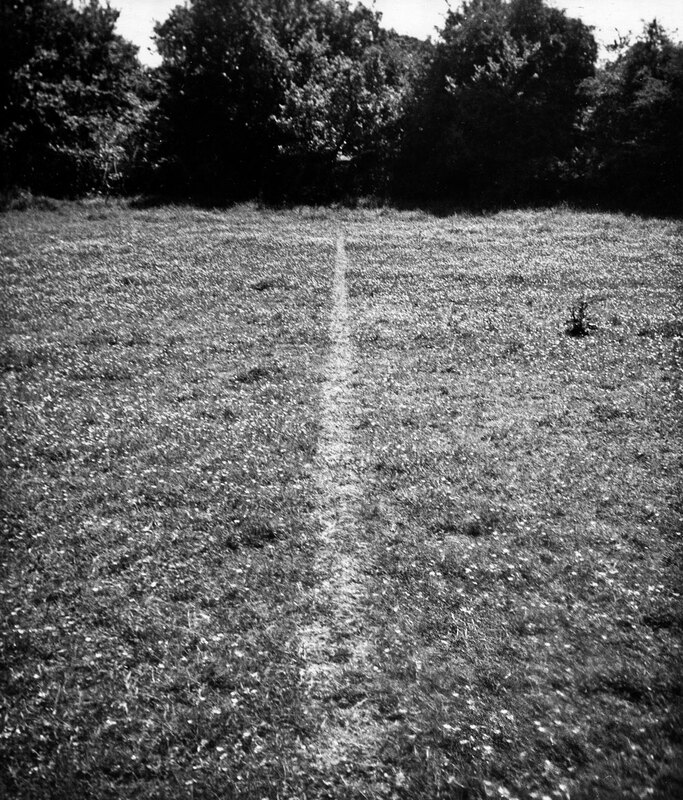 There are lots of drawings that fit neatly under Klee’s description of ‘taking a line for a walk’ but few that do it quite as literally as Ceal Floyer’s Taking a Line for a Walk, in which a line painting machine of the sort normally used to mark out tennis courts and the like is walked through the gallery space leaving a trace that takes the audience on a journey through the space. 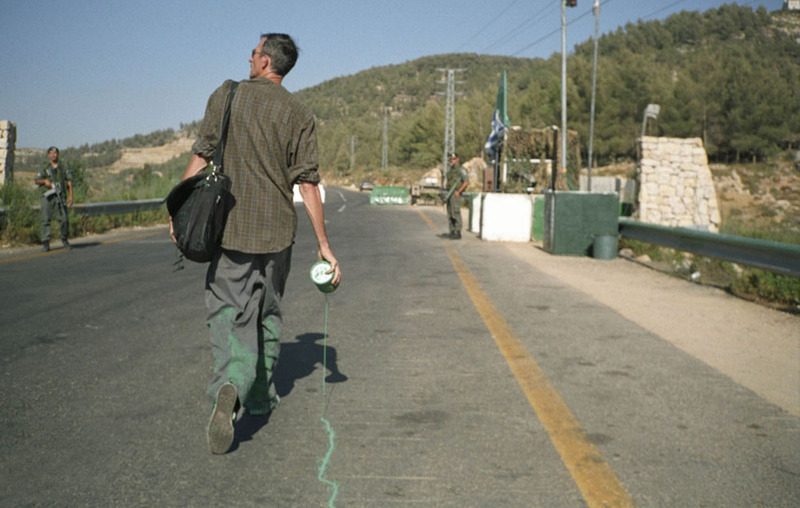 I’ve written about Francis Alÿs going for a walk here before (that time in the form of his Pradox of Praxis for which he pushed a block of ice around the streets of Mexico City until all he had to show for his efforts was a rapidly drying water mark of the pavement) but this week, given the awful news from Gaza, it’s his 2004 work The Green Line: Sometimes doing something poetic can become political and sometimes doing something political can become poetic that’s worked it’s way back into my mind. I can’t pretend to have anything more than the most rudimentary understanding of the politics of the middle east but this is a work that at least helps with some basics by taking us back to the division of Jerusalem after the end of the Arab-Isreali war in 1948: the green line drawn on a map of the city by Moshe Dyan. Encountering favourite works again by chance is always a real pleasure. My visit to the Exchange in Penzance while on holiday in Cornwall was brief but unexpectedly enjoyable. Apart from seeing the title of the show, I hadn’t really checked what was on before pitching up there (I also hadn’t checked what time the gallery closed, hence the brevity of my visit; why do I never learn?) so beyond thinking 3am: wonder, paranoia and the restless night sounded like my kind of exhibition, I arrived, as is so often the case, essentially clueless. 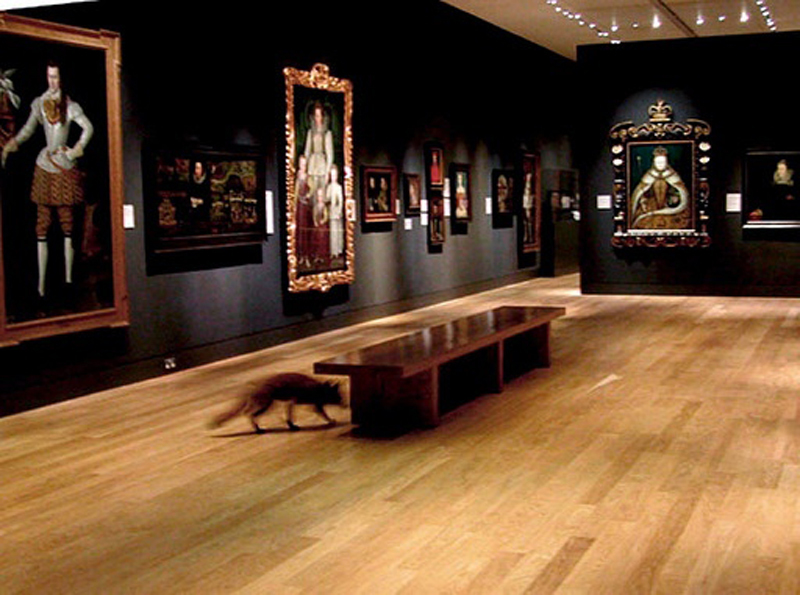 In the main the works I liked the most were the ones I knew already but that’s hardly a problem when those works included some real favourites, especially Francis Alÿs’s The Nightwatch, seen here as a single channel video but sometimes shown as a bank of monitors. 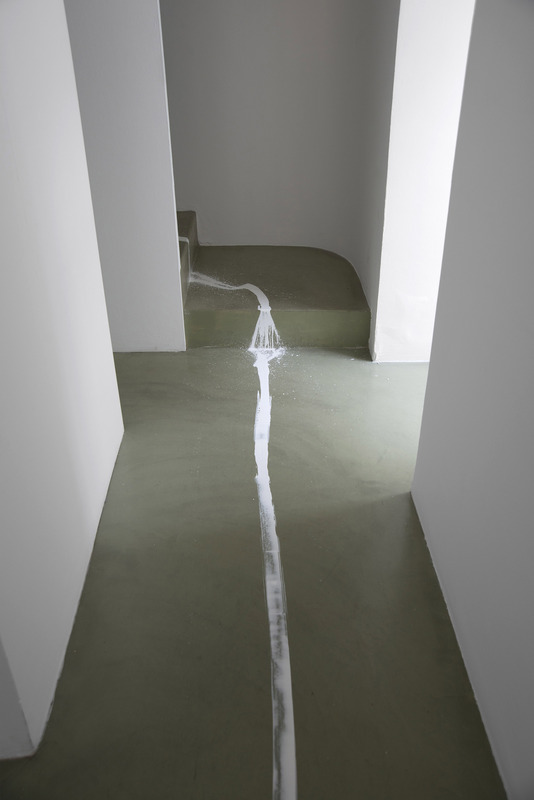 Francis Alÿs is probably one of my favourite artists (I’m fickle, it’s an ever changing list; but he’s usually on it, I would say) and The Nightwatch is one of the main reasons why. I often think my journey to work is a bit ridiculous. Like many people teaching in art colleges, I live in London but work elsewhere. On a good day* my commute is a four and a half hour round trip, give or take a bit. Though there is art in other cities – a lot in some places, but then Glasgow would be an even stupider commute for me – for me, being in London makes the most sense. (Plus, you know, I’m a Londoner. Always have been and probably always will be.) It’s just that I don’t happen to work here. Like many of my colleagues, I accumulate piles of train tickets. 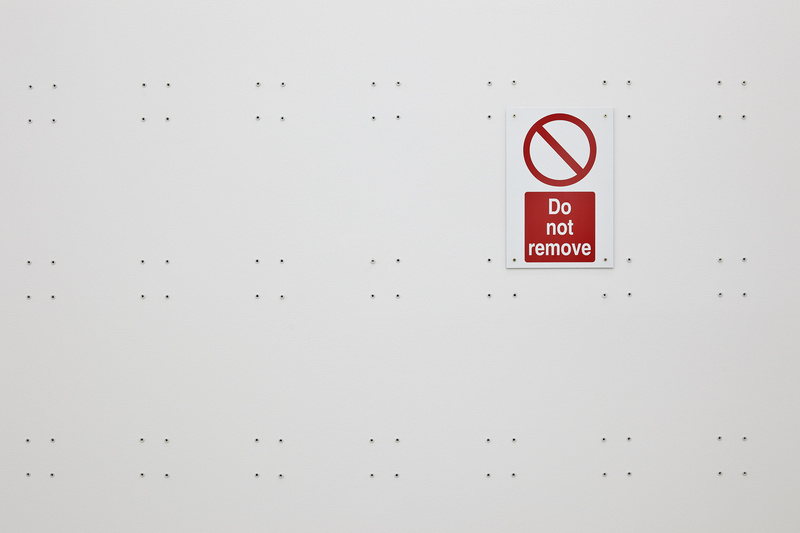 Many of us seem to have vague plans to make a piece of work with them at some point. Whether anyone ever will, I don’t know (I’ve yet to see the evidence if they have). I know I haven’t (and, in all honesty, probably never will). 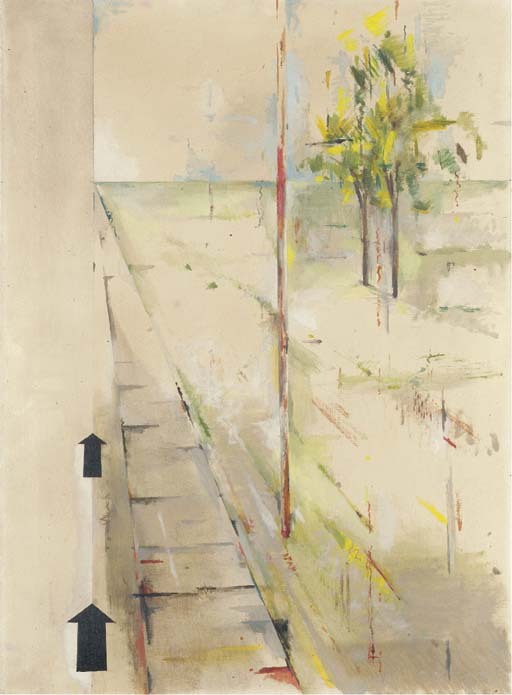 All of which means that there was one series of works in the Richard Hamilton exhibition at Tate Modern that really resonated: the Trainsition paintings. Hamilton taught at Newcastle for years but, it seems, stayed living in London. Suddenly my commute seems positively mundane. Unlike me though, Hamilton turned the experience into art. Well done that man. I would say I promise to stop writing about Ceal Floyer’s work soon, but, well, there’s at least one more post forming itself in my head so who knows really. She provides just the right mix of ideas, empty white space (usually, but of course now another post, about work that isn’t empty or white is starting to form) and playfulness to make sure I’m fully engaged. In consisting largely of rawlplugs, Do Not Remove reminds me quite a lot of (some of) Susan Collis’s work which I’ve also written about here ad nauseam. Plus, there’s a sign and I rather like signs (indeed I find myself slight surprised to find that I haven’t tagged loads of posts as ‘signs’ but I suspect that’s down to shoddy tagging rather than a lack of posts about signs).